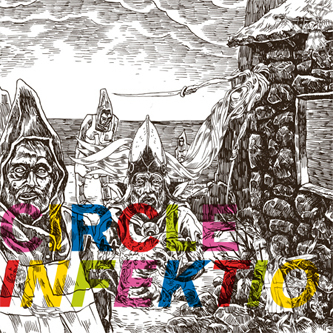 Finnish avant-metal institution, Circle embark on a primitive Kosmische journey on their first album released through Conspiracy Records. Their press release alludes to a kind of "mellow caveman jam", but listening to the fifteen-minute opener 'Salvos' we'd say it's a bit more forward thinking, like maybe viking era, at least. Yeah, vikings slashed on psilocybic Reindeer p*ss, out in the woods with a real, real early synthesizer carved from pine and copper and powered by a stray ball of lightening, eyes turned towards the Aurora Borealis lightshow over the mountains and gunky drool meshed into flaming ginger beards. Further in, 'Maatunut' anticipates European avant-jazz by around a millennia, before 'Peruuttamaton' summons sludgy bass and searching, unstable percussion, and 'Pisara' imagines a more frazzled future of Afrobeat. That's right, Afrobeat came from Finland! 'Kalpea' concludes the album in a more sublime state, where cascading streams of avant-classcial piano keys dance around shut-eyed percussion and gaseous guitar notes. The artwork from Ville Pirinen strongly reminds of Zeke Clough's Skull Disco work, too. Recommended, then!